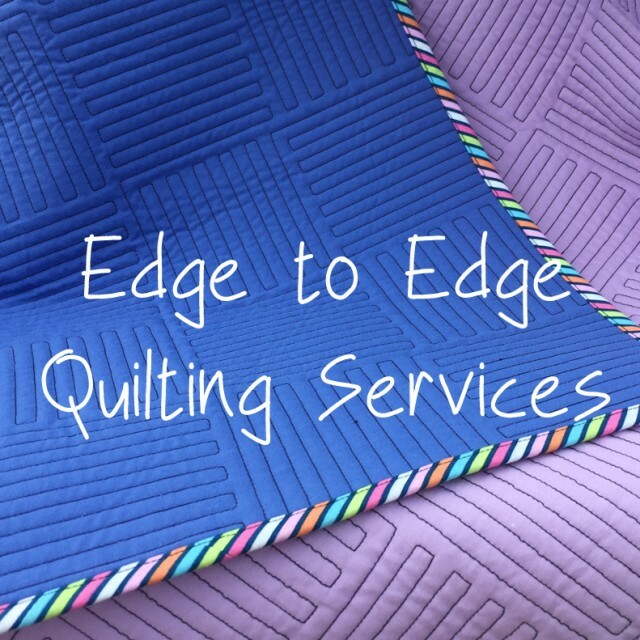 Win Edge to Edge Longarm Quilting for Sew Mama Sew Giveaway Day! Update: This Giveaway is now closed. Congratulations Lauren! Sew Mama Sew Giveaway Day rolls around twice a year and today I am thrilled to offer free edge to edge quilting for a lap or twin sized quilt. It is such an honor to be involved in your creative endeavors, and I love to help you bring your quilt tops one step closer to being used and cherished by your loved ones. I quilt on a computerized A-1 Elite machine, guaranteeing beautiful, accurate stitches. The edge to edge designs I am currently offering are all quilting patterns that I have created myself using AutoCad. 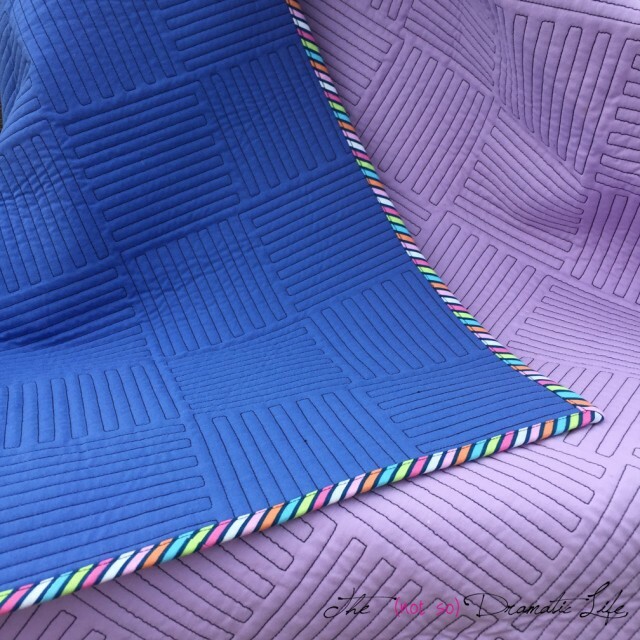 Interlocking is my most popular design, and it looks great with a variety of contemporary quilt styles. Graphic block based quilts, improvisationally pieced designs, whole cloth quilts, and T-shirt quilts all look great with this quilting design. Floral Spirals has a whimsical feel and is a lovely way to soften a graphic pieced design or add interest to a simply pieced or whole cloth/panel quilt. I am adding new designs all the time, and I can also work with you to create a customized edge to edge pattern to coordinate with your fabrics or quilt top. This giveaway will be for quilting services for one quilt that is up to 6,000 square inches, but I still have plenty of openings available if you would like to have your quilts done for Christmas! My edge to edge quilting rates are 2 cents per square inch. (To calculate the square inches, multiply the quilt top length by the quilt top width. For example a quilt measuring 50″ x 70″ would be 3,500 square inches. Multiply that by .02 to determine the quilting cost. 3,500 x .02 = $70.00 ) Please email me at cassandra(at)thenotsodramaticlife(d0t)com if you would like more information about the quilting services I currently offer. This giveaway is open from Wednesday, December 9 to 11:59pm Eastern on Sunday, December 13th. I will notify the winner both by email and on the blog by Wednesday, December 16th. If you are selected, I will send you a form to fill out and enclose with your quilt top, quilt backing (which should measure at lease 8″ larger than the top in both width and length), and batting of your choice. You are responsible for shipping these items to me. * I do ask that your quilt top arrive between the the winner announcement of this giveaway and March 31, 2016. In the coming year, I am hoping to include several tutorials of quilting/textile techniques on the blog. You may enter this giveaway by leaving any comment, but I would really love to hear about what kinds of tutorials you would be interested in seeing! The winner will be determined by a random drawing. * In the event that the selected person is located in the Central or West Central part of Ohio, an in person pick-up/drop-off may be arranged. Good Luck! Please be sure to check out all of the other fantastic giveaways going on this week on Sew Mama Sew! What a wonderful prize! I love your quilting and hope I win. I would love to see some tutorials on different FMQ designs you have developed. I love your interlocking design. Thanks for your giveaway. Those are lovely quilting designs! What a wonderful giveaway! I think that tutorials about how to come up with simple design that are easy to quilt on a domestic machine would be very interesting! Thank you so much for such a generous giveaway! I have never gotten a quilt professionally quilted, so I would love the opportunity. I have quite a pile of quilt tops adding up that I need to get around to quilting, so this would be great for helping me with that. I would love to see tutorials/techniques on how best to manage large quilts on my home sewing machine. Thanks again for the giveaway! OMG! This is the best giveaway! I would love to make a quilt and send it off. I rarely ever get to do that! Thank you so much! That is such a generous giveaway. You do beautiful quilting. What a great prize! Fingers crossed! I love free motion quilting tutorials. Wow! Fabulous prize. Please pick me, I have so many finished tops in the cue. I have quite a few finished tops that need some quilting. I like to do it all by hand but your rates are really not bad. I would love to win this, and may bookmark your site for future reference! Your work is always gorgeous to admire – I would love to win the chance to bring some home with me!! This is an amazing give away, and I’m not sure that I have ever read of someone giving away their services before. I love that idea. I always love new free motion quilting tutorials. Oh, what lovely quilting this is! I love your Interlocking pattern and would adore that on solids just as pictured, rather than a pieced quilt. For tutorial interest, I think tips on what a longarm quilter needs from the quilt top piecer/creator would be good because many don’t understand that some of the things done in piecing make a project difficult to quilt. I have just the quilts for your giveaway! Thanks for doing this. LOve the flowery designs. Wow! what an incredibly generous giveway! Thanks for a chance to win. Your quilting is beautiful. Have a quilt quilted for you is always a wonderful weight lifted! That is the part that makes me so nervous, because I have visions of ruining the top I have so painstakingly pieced. Wow! what a great give away. I really like the Interlocking Edge to Edge Quilting Design and I have several quilt tops I could send off very soon! Thank you for putting my name in the hat. Oh my goodness, what a wonderful prize! Eep! I’d be so thrilled to win 🙂 and your tips would be greatly appreciated! Wow! What an amazing giveaway! Both those patterns look so cool. This would be a perfect kick in the pants to get a queen sized quilt top done that I’ve been working on for YEARS! 🙂 Ok, not actively working on it for years but I did start it a long, long time ago. I would love tips on picking the best home machine for quilting. Thank you for sharing your skills and time! I am new to sewing, just started this year. I never learned how to sew as a child, besides hand stitching buttons and sewing patches. No one in my family every owned a sewing machine. My mother-in-law made me a quilt and I was just amazed on how detailed a quilt can be. There is so many things out there that I would love to create, hopefully with the continued help of Sew Mama Sew, I will be moving from a “beginner” to a “intermediate” sewist in no time. I would love to be able to finish my own quilt tops, but for now, I need help with this. Wow! What a generous giveaway! When it comes to the quilting portion of making a quilt complete, I’m always so intimidated by basting and making sure everything lays flat. I would love a tutorial on how best to baste if you don’t have a longarm or any other fancy tools. Oh, I so hope I win ! I may just have to buy this if I don’t – I’ve had a finished quilt top waiting for me to have time to quilt for… 5 years ? Come on Christmas ! I love your interlocking quilting, great giveaway! How exciting…..I’ve never had a quilt professionally quilted. I’ve been quilting my own quilts on a home machine, but with plans for a quilt a month for my new grandson’s first year, this would be wonderful to win! I love your work! Thanks for the chance to win!!! I would love to win this. ive got a few tops im about done with and Ive never had one professionally quilted! Thanks for the chance. Wow! What an awesome giveaway – I love that you love to create your own designs! This is such an awesome giveaway! I love seeing tutorials on FMQ designs and seeing the process from start to finish is so helpful. Thanks for the chance to win. What a unique giveaway. Thanks for the chance to win. Love that floral design! Thanks for the chance. Great giveaway! I’ve never sent a quilt away to be quilted on a longarm – would love to try it! Designing your own quilting patterns with AutoCad is impressive. What a generous prize! I would love to win this. I have a quilt ready to send. That’s awesome! I didn’t realize you were designing your patterns; I like the Floral Spiral. Nice work!! What a generous giveaway! I have nearly finished my second (ever) quilt top so this would be great. Many thanks! There’s a Spring themed quilt top in my closet for a special sister and I’d love to have this quilted w/ a graphic /geometric design . I actually have a quilt that I think is twin sized…well, actually not a quilt – just the top! I would love to see it finished. Thank you so much for the chance. I have never sent a quilt out yet, this is awesome! Thanks for the chance! What an amazing giveaway! Thanks for the chance! Wow, this is such a wonderful giveaway. I love your work. Oooh, your interlocking design is super cool! 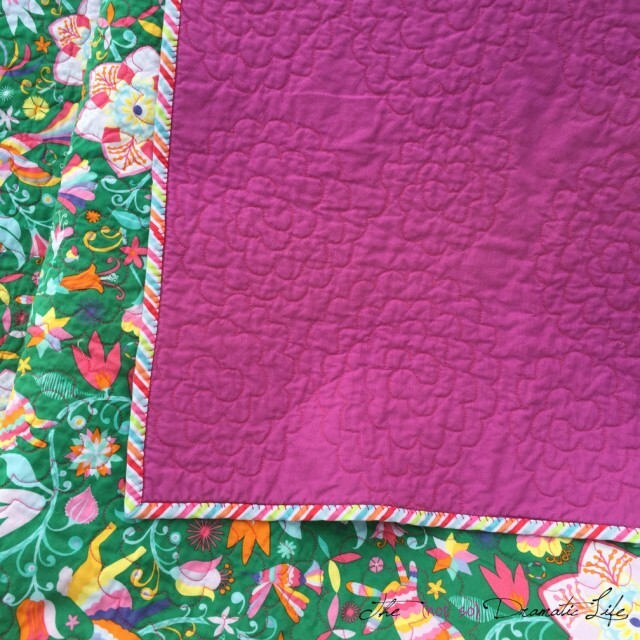 Beautiful quilting and awesome giveaway! Thank you so much for sharing! What a generous prize! I have seen professionally quilted projects and would love to have one quilted by you! Fingers crossed! What a great prize — thanks for the chance! What a fantastic prize!! My fingers are crossed SO hard! 🙂 your designs are lovely! What a wonderfully generous prize! I’ve never had one of my quilts professionally quilted before. Thanks for the chance to win. Your work is beautiful. I would love to win edge to edge longarm quilting. Tutorials on how to select quilting motifs to enhance a quilt would be wonderful. Or how about how you customize edge to edge quilting to enhance a quilt. That would be fascinating. WOW! What an awesome giveaway! I would love to learn more about machine quilting. I love FMQ tutorials, but have been too anxious to try. A tutorial to help me overcome my fear would be great! Great idea! My own fmq is pretty poor so having something I pieced that I’m proud of professionally done would be amazing! I love both designs, but the interlocking design is simply amazing! I’d love to see some tutorials for quilting on a domestic machine. Thanks for the giveaway! Wow great giveaway my fmq is not up to par so I have a top or two that needs this giveaway. Thanks for the wonderful giveaway. I have only had one of my quilts long armed quilted and that was over 15 years ago. It was donated to a charity auction. I am still learning on how to set up my machine to even attempt free motion quilting. I have so many tops waiting to be done. This would be terrific. Lovely designs. I have never had a quilt professional done. Thank you for the generous giveaway. Wow! What an amazing giveaway! I’m still learning the basics of quilting so any and all tutorials are helpful. I’m definitely wanted to learn more about FMQ and Quilt as you Go methods, as well as machine binding techniques. Thanks for the opportunity! The quilting is gorgeous. I’ve only had one piece completed on a long arm & it turned out great. Thanks for the give away opportunity! I’m always looking for tutorials on how you choose what pattern to quilt on each quilt. I usually get stuck on that part. Thanks for the chance to win! Amazing! I have a whole satack of rops that I want to get done but have never had one professionally done. This would definitely be special! I’d love to have you do a quilt for me. I can’t believe this is a giveaway, Cassandra. What a generous offer. You’ve come miles in the short time you’ve had your longarm. I am so impressed. Thanks. Eeeeeeep! I really want to win this. I’m working on finishing up my first lap quilt and am pretty sure I want to have it quilted for me. I don’t know that my $200 Brother (or me for that matter) is quite up to that challenge. Your quilting is beautiful and the designs too! I would love to win! Such a wonderful giveaway! I am always interested in FMQ techniques. I’ve never had a quilt professionally quilted. How about a post about sending a quilt to a longarmer for the first time: things to make sure you do, or things newbies do that cause trouble for longarmers? Hope that makes sense. I’ve considered sending a quilt to a longarmer, but I am a little afraid they might look at the quilt top and not like how it was pieced (too many loose threads, too little seam allowance, etc.). Oh your work is wonderful! It would be great! Thanks for an awesome giveaway!!! That’s awesome! Thank you so much for this wonderful giveaway. This would be fantastic! Wow! I’ve always wanted to try to have a longarm do one quilt. Savvy advertising! Getting ready to have my first professional quilting job done. Would love to win this! I love your work Cassandra! That first design is amazing! I would like to learn more about free motion quilting on a regular sewing machine. How about new patterns? I love the ones in your pictures above. Stippling is getting old fast. What a generous giveaway. Thanks for sharing your talent. Such a generous giveaway! I’ve never had a quilt professionally quilted but its something I keep thinking about every time I struggle to get a quilt in and out of a tiny throat space. Your work is beautiful! I love the interlocking pattern! Merry Christmas! What an amazing giveaway!! crossing my fingers and my toes! Merry Christmas! Thank you for such a generous giveaway! My name is Cassandra, and I have been sewing for as long as I can remember. I love looking for inspiration in my surroundings, and my life as a theatrical scenic and costume designer heavily influences my quilt designs. Would you like to follow via email? Please click the circular icon above that is furthest to the left to have each post delivered directly to you. Thanks for joining! This blog is based on my own ideas and opinions. You are welcome to link to this site at any time. If you would like to use images or text please contact me first (I will probably say yes! ), and provide appropriate credit in your post. I love Pinterest so pin away as long as the image is labeled accurately and links directly back to this site. Please feel free to contact me at: cassandra (at) thenotsodramaticlife (dot) com.Thank you so much for visiting!